Stretch marks are totally natural, but that doesn’t mean they’re not frustrating to deal with. Many women get stretch marks after they’re pregnant, but they can occur at almost any age, usually when there are changes going on with your body (puberty, weight gain, etc.). If you’ve noticed stretch marks that you want to get rid of, we’re talking about what they actually are, how to prevent them, and 5 of the best natural remedies for stretch marks that really work! Don’t get too stressed out when you notice stretch marks! They’re a normal part of puberty and the ever-changing body. Stretch marks are a form of scarring on the skin that leaves off-colour marks. They’re usually red or purplish to start with and then fade to a silvery-white colour. They show up as narrow streaks or lines on the surface of the skin when the skin is stretched out too quickly. They can happen to anyone and usually affect areas where fat is stored such as the tummy, breasts, upper arms, buttocks and thighs. As I mentioned before, stretch marks occur when the skin is stretched out too quickly. Skin stretching as well as an increase of cortisone in your body are the main reasons for stretch marks. Cortisone is a hormone that’s naturally produced by your adrenal glands, and having too much of it can cause your skin to lose its elasticity. Some reasons for stretch marks could be pregnancy, rapid weight gain or loss, and puberty. They can also occur if you have a family history of stretch marks, or if you have an underlying health condition such as Cushings syndrome, where your blood contains high levels of the cortisol hormone. And if you use corticosteroid creams, lotions and pills, be careful how much you use, because they can decrease you skin’s ability to stretch, causing stretch marks. Now that you know what stretch marks are and what causes them, here are 4 tips to prevent stretch marks from showing up in the first place. The more nutrients you have in your diet, the healthier your skin will be. Stretch marks can occur if you lack nutrients in certain areas, so make sure to eat foods rich in vitamins C,D,E, zinc and protein. Choose unprocessed, natural ingredients to get the most out of your food! Drinking adequate quantities of H2O is one of the best ways to keep your skin hydrated and soft. When you have soft skin, you’re less likely to develop stretch marks than if you have dry skin. Drinking caffeinated beverages like coffee can actually increase your risk of stretch marks since they dehydrate your skin, so drink as much water as you can! Vitamin C has been shown to keep skin strong and elastic. It’s known to help reduce the appearance of wrinkles, and could also play an important role in preventing stretch marks. It’s an important nutrient for the production of collagen (the main structural protein in skin), and can be found in fruits and vegetables such as oranges, lemons, pineapple, mangos, chili peppers, sweet yellow peppers and more! Since stretch marks can occur due to rapid weight change, it’s important to maintain a healthy weight. Eat right and get regular exercise. Exercise not only helps you stay at a healthy weight, it also increases blood flow to the skin, helping the skin rebuild itself. 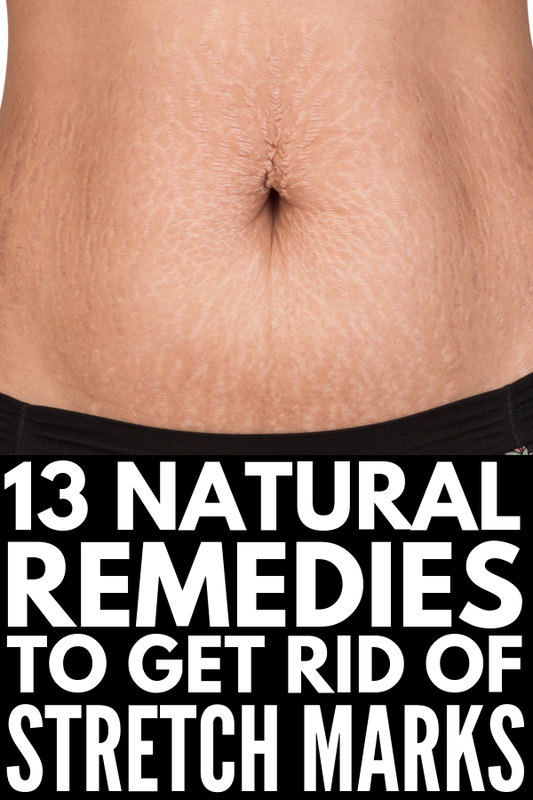 If you’re wondering how to get rid of stretch marks naturally, try these remedies! Shea butter is one of the best natural stretch mark remedies. It’s extremely moisturizing for the skin and also has amazing anti inflammatory and antioxidant properties. Apply shea butter on your stretch marks and leave it on, reapplying it a few times a day. It will keep your skin healthy and repair any damaged cells. Aloe vera is a natural skin softener and healing agent. It soothes the skin and quickens the healing process, fading your stretch marks. It’s also packed with essential vitamins, minerals and enzymes with antioxidant properties. Apply pure aloe vera from an aloe vera plant to your stretch marks after you shower, or opt for an aloe vera gel instead..
Castor oil is great to eliminate stretch marks due to the ricinoleic acid, which accelerates the healing of stretch marks and fades their colouring. Warm the oil slightly and massage it on to your stretch marks for 15 to 20 minutes. You may notice that vitamin E makes an appearance in creams that are known to remove scars and prevent skin aging. The oil nourishes the skin with its antioxidant and anti-inflammatory properties, and aids in healing scars and stretch marks. Cut open vitamin E capsules, massaging the oil into your stretch marks for a few minutes. Leave the oil on. Coffee has come to be one of the go-to natural remedies for stretch marks. Mix coffee grounds with water to make a paste and scrub it gently over the affected areas in circular motions for 5 minutes. Then, wash it off with warm water. The gentle scrubbing with increase the blood flow in that area, while the coffee itself degrades fats underneath the skin and also has antioxidant properties. These 4 products are at the top of their game when it comes to eliminating stretch marks! 1. Earth Mama Belly Butter: If you want to know how to get rid of stretch marks on your stomach (especially if you’re pregnant), this lotion is naturally hydrating with shea butter, organic herbs and organic essential oils to calm stretching skin and decrease the appearance of stretch marks. 2. Botanic Tree Stretch Mark Cream: With high quality ingredients including cocoa butter, shea butter, vitamin B5 and olive oil, this cream delivers intense hydration and reduces stretch marks and scars. 3. Mederma Quick Dry Oil: This oil combines Cepalin with natural botanicals to improve the appearance of scars and stretch marks. It goes on as an oil, but dries fast so you won’t get that sticky, greasy feeling. 4. Palmer’s Cocoa Butter Skin Therapy Oil: This oil contains cocoa butter, vitamin E, sesame oil, rosehip oil, and argan oil. The ultra-moisturizing combination works to soften and condition the skin, minimizing the appearance of stretch marks. If you’re looking to diminish your stretch marks, use these remedies to get your skin back to normal! If you loved these natural remedies for stretch marks, please share this post on Pinterest! And if you want more beauty related tips and tricks, please follow our Beauty Board on Pinterest!